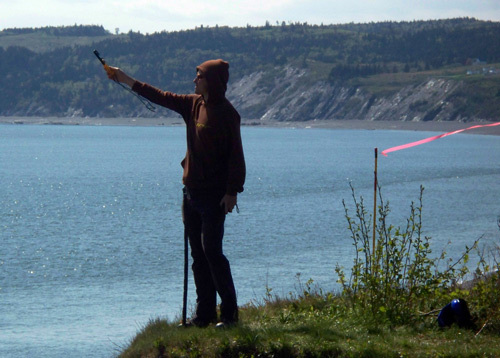 The Festival of Flight has been occurring in the Parrsboro area since 1996 and is a popular event among local pilots. 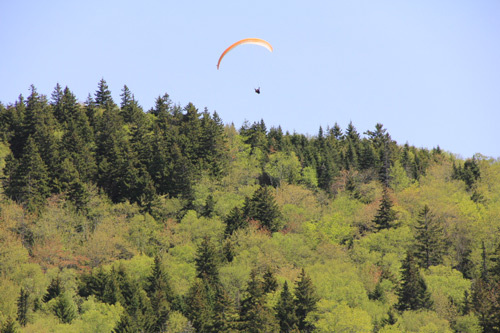 This 16th Annual festival included a record numbers of paragliders, hang gliders, power-paragliders in attendance. The weather was warm and sunny, but the strong high-pressure system that supplied the warmest long-weekend weather in many years kept the on-shore breezes light for much of the weekend. Regardless of the calm air, there were some periods of excellent flying activity. On Friday there were several paragliding pilots who took to the air at Fox River. Paragliders fill the air at Fox River : Gabe Carrier, Gunter Gottschalk, Chris Jette, Michael Fuller with tandem. Later in the afternoon on Friday the wind did build quite strong. So, it was time for the hang gliders to spread their wings. Visit the Facebook page to see a video of Brian launching and starting his soaring flight at Fox River. Saturday brought the start of light air. There were periods that no matter how many times we checked the wind, it just stayed a little too light or a little too cross. It’s all about chasing wind though. The crew began Saturday at Hidden falls, where there were several good flights. Rob (a new pilot from Saint John) won the target landing competition, hitting the bulls eye on the first try. Michael and several other pilots grabbed short soaring flights that morning. Michael soaring some light thermals at Hidden Falls. The power-paragliders often stay along the shoreline, but while free-flight pilots were waiting out a lull at Hidden Falls, Tim Rieker powered over from Second Beach and found some lift among the neighbouring ridges. As tradition dictates, the Saturday evening festivities included fresh lobster around a beach fire – on the shores of the Bay of Fundy. A wonderful part of the Festival indeed. 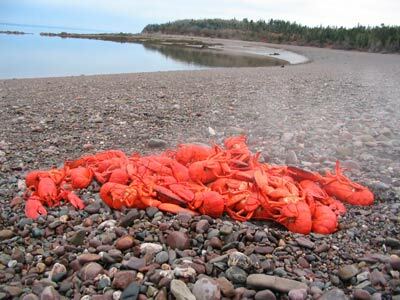 Fresh cooked lobster along the shores of the Bay of Fundy! 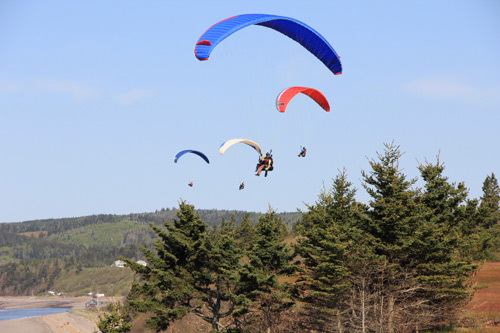 Over the next couple of days calm air would not slow them down, as several hang-gliding pilots took advantage of Scott’s towing equipment being on site for the festival. The crew beach towed several pilots who each logged a few flights. When not flying there was great opportunities for local pilots to socialize and share stories of their recent adventures. The lunch truck was a huge contribution this year – thanks to George and Deann! The Annual General Meeting was held at the Bare Bones Bistro and the food was beyond excellent. What a treasure to have such high quality dining in a small coastal town like Parrsboro. Of course another important aspect of this year’s Festival was the Fly for Discovery fundraising activity that HPAAC pilots have organized for the second year, in honour of our friend and fellow pilot Mark Dempsey. The fundraising efforts of the pilots exceeded their goal and raised over $7000 for Cancer Society of Canada early diagnosis programs… and the pledges keep coming in. A special congratulations to Gabe Carrier for reaching out for the Fly For Discovery Campaign. He was the top fundraiser with over $1,000 coming in to support his participation. The 2012 Festival of Flight was a great success, and a positive start to the flying year. Thank you to those who put so much work into organizing this event. An open invitation to all pilots. PEI is holding our fifth annual Tow Jam. This event will be held on June 19th, 20th, & 21st, 2009. So put it on your calendars now and plan to join us.